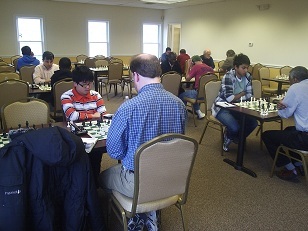 Saturday Winter Quads at CCFC included 3 sections and 14 players! Section 1 was a Quad, in which Joshua Colas, Leif Pressman, Daniel Lowinger, and Sam Alex Barsky played. After some intense struggles that came down to the last seconds, New Yorker Joshua Colas, took first place with 2.5 points while Pressman followed close behind with a 2.0. Section 2 involved Melvin Patrick, Guy Colas, Hubert Herring, Druha Karunakaran, Tom Dionne, and Leo Bykhovsky in a swiss. This section was so competitive that after the first two rounds, the two top seeds had not managed to score any points! Our very own, Melvin Patrick took first place honors with 3 points! Colas made second with 2 points! Having 4 closely rated players in the Quad for the 3rd section made the outcome very tight. Matthew Chan and David Childs tied for first place with 2.5 points! Congratulations to all!